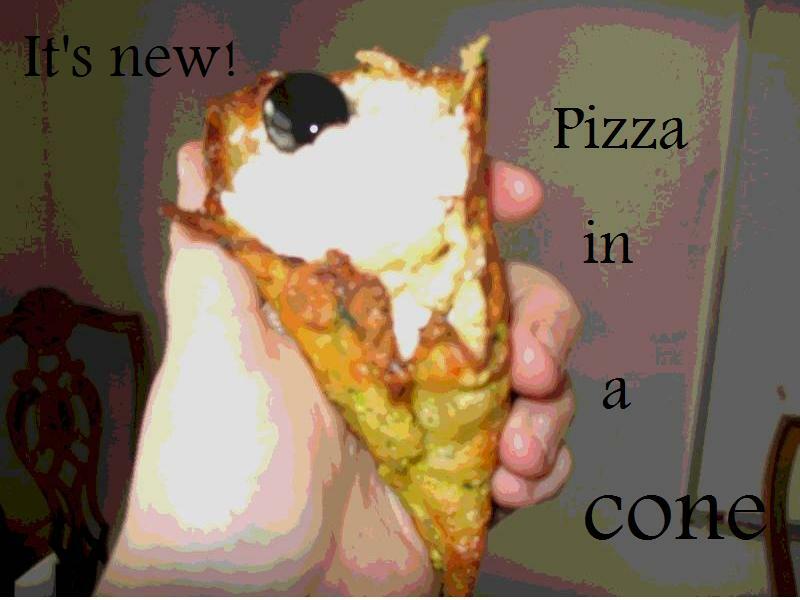 Pizza in a cone… one… one…. one…. Billy was struggling in school. Hungry and dejected during geography tests, Mom swung by with some healthy goodness. Camera cuts to teacher handing back Billy’s paper with an A, halo glowing around thick, black fonty goodness. To keep you on keel, have this conical meal! Mix ingredients. Make 4 8″ circles on a greased cookie sheet (if there is extra dough left over, set this aside). Bake circles for 12 minutes. Let cool for 20 minutes, until patties are solid enough to lift carefully with a spatula. Flip and bake until they start to brown, or 5 minutes more. Wrap around a conical shape (I used a stapled paper plate wrapped with parchment). Let cool on a cooling rack over night. In a glass baking dish, press out any remaining zucchini dough. Top with sauce, vegetable toppings and cheese. Bake for 15-20 minutes, or until cheese is brown and bubbly. Let cool slightly. In a bowl, combine Ricotta cheese with 2 Tbsp pizza sauce. Let rest. In bottom of cone, drop a black olive. Top with cooled pizza casserole to about half way. Scoop 1/4 of the ricotta/sauce mix on top, smooth-side up. Top with black olive. I think you must need kids in the house to do this. As a single person, it would never enter my mind to try something like this. Hope it tasted good. This could be the rival for Steve Martin’s favorite pizza in a cup franchise in the movie, “The Jerk”! Your concoctions make my mouth water. LOL LOL Cleo I swear looking at it I thought you had invented a ziplock icecream in a zuchini cone. OK, so this makes me think… if you can eat pizza in a cone… you can eat eggs and sausage in a cone… you could eat burritos in a cone… (would it still be a burrito then? And if the cone fell to the floor and no lowcarber was there to pick it up, would it still be lowcarb?) Can you taste the zucchini? I’m usually the comic relief in this house, but with your blog all I have to do is read aloud and funny is done! Now you can take a bow LOL! I have a question, speaking of pizza. We are big anime fans around here. Several months ago a cartoon introduced us to the Japanese dish okinomiyaki, or Japanese pizza. If you Google it you can find all sorts of recipes. And I found the sauce topping at a Japanese grocery and, if you remain within the serving size limit, the carb count isn’t much worse than ketchup. But if I’m low-carbing I can’t use flour, obviously, plus wheat seems to make my daughter crazy. So I was wondering if there is some way to do this low-carb, because I’d love to try it. Aside from the flour it is full of cabbage and meats, so from a whole food perspective it actually seems kind of healthy. I’m not sure you could do it with oopsies but maybe with some other approach? I can see the potential with the cone and not just with pizza or Mexican Food! Maybe you explained this many recipes ago, but how do you shread your zucchini for all of your recipes? Do you use a flat hand grater, a food processor grating disk, or some other device? LOL! You guys rock my socks. What? You mean there has been pizza in a cone? Nuts! Well, I’ll bet there’s never been pizza in an edible low-carb cone! I’ll have to settle for those odd little inklings instead. Now I have that thermos song stuck in my head! Oh, for the zucchini, I just grate across a cheese grater (up and down or at an angle) as I would a piece of cheese. It’s easier than I thought it would be, and because you leave the skin on, it doesn’t fall apart. Clever, clever, clever! I am looking for low carb recipes and you have opened the door to interesting combinations! Thank you! I made the cones earlier this afternoon & want to do step 2 and eat them tomorrow evening (more than 24 hrs). Where should I store the cones, in the fridge or on the counter? They look like they have already formed their shape. Hi! I would store these in the fridge after a day since I think they’d start to go a little stale otherwise. That said, I’d make enough for the day and probably no more than that.